Note to Parents: Help your family embrace God’s love for the world. Read this story together to learn about and pray for the Kazakhs, a people group in Central Asia. Hi, I’m Zamira. Welcome to Astana. My friends and I would be honored if you would attend our dastarkhan (dahs-tarh-qan), a feast for special guests like you. Slip off your shoes at the door and join us. How do you like the colorful tablecloth I spread out on the floor? We don’t eat at a table. Here comes Mother with her best teapot and a platter of puffy, fried breads. I think they look like little pillows. The sweet ones taste similar to doughnuts. Since this is your first time in Kazakhstan, I will help you learn our customs. Some are passed down from the days when our ancestors lived in yurts – tents they could set up and take down easily as they followed their cattle and horses to good pasture. Most Kazakhs don’t live in yurts anymore, but we still enjoy sitting on thick beautiful carpets, sharing tea, and eating feasts together. My friend is bringing a pitcher of warm water, a basin, and a towel for washing up. We usually eat with our hands. In fact our national dish is called “five fingers.” You will get to try this dish of sheep meat, egg noodles, carrots, and potatoes a little later. But first, here’s your kesey (key-see-ay), or teacup. It’s only filled partway so you can drink all your tea before it gets cold. Just pass your empty cup to Mother and she’ll keep pouring more. Kazakh tea may taste a little different than what you’re used to – we add salt and butter instead of cream and sugar. Tomorrow, you can visit my class at school. I attend the morning shift, but some students begin class after lunch. I have had the same teacher since Grade 1 and she is like a second mother to me. My class is learning math, history, geography, writing, and reading. Even though my family speaks Kazakh at home, we use Russian at school and in town. When school ends I must do homework, but afterwards we can play Blind Man’s Bluff or Hide and Seek. Many Kazakhs consider the Christian faith to be a belief system for Russian families. They believe that to be Kazakh is to be Muslim. 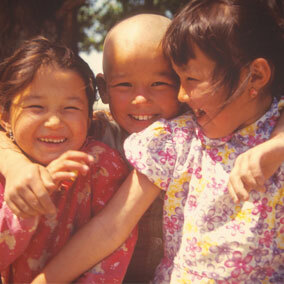 Pray that they will understand that following Jesus will not cause them to lose their cultural identity as Kazakhs. A few small gatherings of Kazakh believers exist in the cities. Pray for urban believers to share their faith with friends and family living in the villages.